OwlCrowd campaign will help high school students learn practical skills, forge lifelong relationships and find a path to college and future careers. Every summer for three decades, The Tyler School of Art’s Pre-College Programs at Temple University have offered high school students—some of whom have never been on a college campus before—the chance to see themselves as college students and help realize their dreams of studying at one of the nation’s preeminent schools for art and architecture. Temple’s 15th OwlCrowd campaign (March 20–May 4), the university’s innovative annual crowdfunding push, is giving the extended Tyler family and the regional art, design and architecture communities an opportunity to support those students. “[Tyler’s] summer classes helped make the decision that I was going to go to art school and major in something creative,” says August Barrett of West Chester, Pennsylvania, who attended Tyler’s Architecture Institute and Portfolio Boot Camp in 2016 and is now a sophomore in the accelerated 4+1 B.S. in Architecture/Master of Architecture program at Tyler. Tyler’s Pre-College Programs—the largest pre-college programs of any type at Temple—attract hundreds of regional high schoolers, from New York to Baltimore, as well as national and international students. 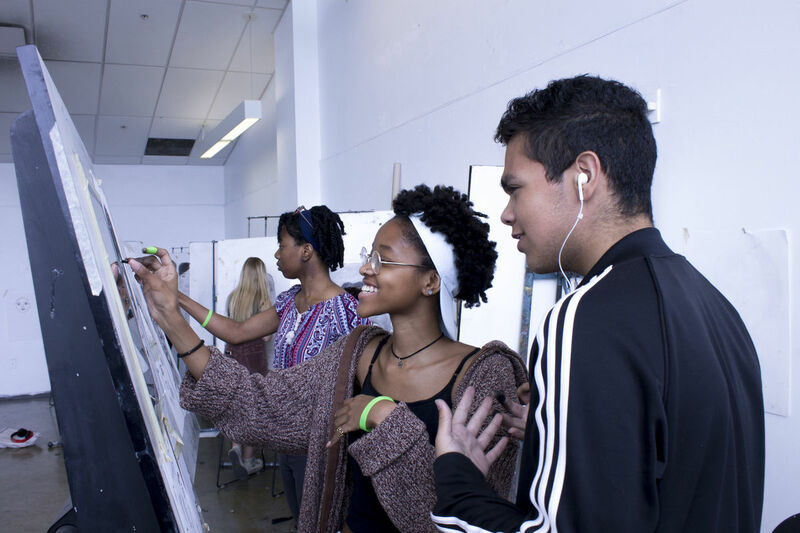 The Pre-College Summer Workshops, Architecture Institute, Portfolio Boot Camp and Visual Studies Academy bring teenagers with shared interests together to work in Tyler’s state-of-the-art facilities while experiencing a large public research university. Through group critiques, field trips and one-on-one instruction from practicing artists and professionals, students forge lasting relationships, experiment with self-expression and develop critical, creative and technical skills. When Mak Bowdren of Levittown, Pennsylvania, was deciding where to apply to college, they were looking to pursue bioengineering, having primarily taken STEM-based high school courses—a similar path to the rest of their family. Mak’s mother encouraged them to take Tyler Pre-College classes, recognizing their creativity and artistic interests, as a way to meet new people and explore options. “I took graphic design because it wasn’t offered at my high school,” they say. “Tyler’s pre-college graphic design and printmaking courses helped guide me where I want to be.” Now, Mak is a freshman at Tyler, with a plan to double-major in printmaking and sculpture. Tyler Pre-College students learn more than art, design and architecture. Over each two-week session, hobbies and curiosities develop into the foundation for college. Beyond critical thinking, problem solving and other creative skill sets, Tyler Pre-College Program instructors teach their students critical thinking, problem solving, responsibility and resilience—pushing students outside their comfort zones and encouraging risk in a fun, collaborative atmosphere. The personal and academic growth of students over the two-week program isn’t only noticed by the participants themselves; their parents notice it, too. Currently, Tyler offers partial scholarships to help teenagers from all over the country and world experience a college environment and develop applicable skills, with a goal of offering more students full scholarships to help shape the next generation of bold thinkers and makers. Many high school students rely on financial support to attend Tyler’s Pre-College Programs, and many must turn down what could be a defining moment in their lives due to insufficient funding. Now through May 4, 2019 you can support Tyler’s summer Pre-College Programs through Temple’s OwlCrowd campaign—100 percent of your generous tax deductible gift will directly support students, with a priority placed on fully-funding scholarships. Make a gift to students of Tyler's Pre-College Programs here. $25 provides a student with a one-week SEPTA pass for Philadelphia-focused field trips. $50 equips one student with all necessary supplies for a two-week summer program. $100 purchases sketchbooks for 50 students. $425 funds a half scholarship for a student to attend a two-week summer program. $850 funds a full scholarship for a student who otherwise could not attend and helps prepare them for college and further study in art or the built environment.